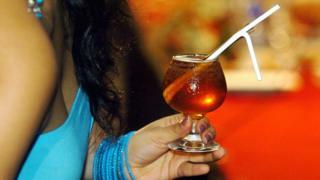 Sri Lanka is to allow women over the age of 18 to buy alcohol legally for the first time in more than 60 years. The government said that it was amending a 1955 law that it agreed was discriminatory against women. The amendment to the law, announced on Wednesday, also means that women will be permitted without prior approval to work in places that sell alcohol. While the previous law was not always strictly enforced, many Sri Lankan women have welcomed the change. Women took to social media to thank the government for its decision, which was announced by Sri Lanka's Finance Minister Mangala Samaraweera. Under the new law, women will no longer require the approval of the state's excise commissioner in order to work or drink "in licensed premises", including restaurants. While the move has been widely welcomed, some argue that it might lead to more women becoming addicted to alcohol. In Sri Lanka, a majority of women traditionally choose not to drink alcohol as they see it as contrary to Sri Lankan culture. However in 2016, Sri Lankan President Maithripala Sirisena, who runs an anti-alcohol campaign in the country, said that alcohol consumption among Sri Lankan women had increased "drastically" in recent years. "We all are aware that drug abuse has become a pressing national issue," he said at the time.